Living life in your RV on the road is liberating, but what happens to the rest of your life when you are on the road? That includes the mail, bills, envelopes, and packages that you may be receiving while you are away. Thankfully, there are some incredible mail forwarding companies and services that you can use so that you don’t miss a beat while you are on your next adventure. Here is our review of four of the best RV mail forwarding services and the benefits that each of them offers. 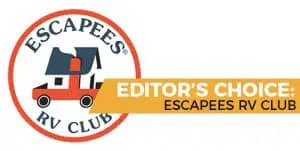 Escapees RV club is a full-service RV club, that is one of the biggest RV clubs and RV support networks in the nation. They offer a variety of services from organized social events and outings to partnerships with RV campgrounds, roadside assistance services, online and in person communities, and even healthcare solutions. Today we are going to be covering their world-class mail services and the mailing solutions that they provide to organize and simplify your life, while you are on the road. The most notable features of their mailing services are tied to the technology and platform that they give you. They have integrated world-class technology with their mail system while making sure that they keep safety and privacy a top priority. It is hard to go wrong with the mail service of one of the most renowned and longest standing RV membership organizations in the nation. Some may be skeptical that this organization has its hand in so many services that they couldn’t possibly do all of this well. Their mail system as a stand-alone service may make you think differently. This service is perfect for the full-time or part-time RV enthusiast or RV family. The only gaps that we can find on anything dealing with their mail service are that their website does not offer a ton of detail about each aspect of the surface. The overview is somewhat superficial, but maybe that is all the customer needs to know. It would be nice to at least have a snapshot or demo of how the online access or the mail review services work. This is one of the lowest flash and also lowest budget RV mail forwarding services that we have looked at thus far. My RV mail gives you everything that you need so that you can get your mail delivered to you and keep it organized. Beyond that, they don’t have a lot of bells and whistles that they offer with their services. We like that this service is simple. If you are just getting into mail forwarding for the first time, they have a platform that is really easy to use. They even give you the flexibility to activate, reactivate, deactivate, and freeze your account as you need to, so that you don’t have to worry about getting stuck in a contract. If you like a mail forwarding service that is simple and works for you without much tweaking or management, this is great. If you are looking for something a little more robust in terms of functionality, customer services, account or software integration, or cloud services, this is probably not the service for you. No limits on mail or packages that you can receive. Access your mailbox from anywhere. All you need is an internet connection. And anyone who wants to simplify and declutter their mailbox. This can help save you trips to FedEx, UPS, and USPS while helping you cut down on the amount of paper mail that you are receiving on a daily or weekly basis. The beauty of this service is that it goes above and beyond simply forwarding your mail to anywhere that you are. They have all of the technology, scanning integrations, cloud space, and software integration that makes it as easy as possible to receive and organize your mail. This service is designed for anyone who wants to save time, optimize their organization, and reduce clutter in their lives. As we mentioned, the Traveling Mailbox can send you your physical mail anywhere. They can do so much more than that too. Some of the biggest selling points of this service include all of the software integrations that they include for all of the scanned, digital versions of your mail and documents. You have unlimited cloud storage with them or can easily integrate your mail and documents on other platforms like Google, Evernote, and Dropbox. There’s not a lot that we can find that we don’t like about this service, though we did notice that they don’t have the greatest reviews on Yelp. Overall, there are a lot of aspects of Usa2me that are similar to My RV Mail, with some added features. They have a few more features that we really appreciate such as the ability to consolidate packing. Their packing consolidation service gives you the ability to save a lot of money on shipping, by packing all of your packages and envelopes into a large box. They also provide shipping services for their customers so that can ship to anywhere as well. Other than that, they offer the standard scanning and shredding features that other mail forwarding services provide. They can scan your mail and process those scans to you for a small fee. Afterward, they will have that mail forwarded to you within 24 hours. This is another straightforward platform with not a ton of flash, show, or added features. This is great if you are looking for a simple and affordable mail forwarding service that works for your on the go lifestyle. Their overall interface could use a facelift and it would be nice if they had some more added services and integrations. Hopefully, you have a better idea of all of the benefits that each of these different RV email services brings to the table so that you can decide on the best one for yourself. All around, Escapee’s RV would be our top choice for mail forwarding. They give you everything that you need out of a quality mail forwarding service and much more, including the trust in an organization that has been working in and with the RV industry for over 30 years.